This is a mild, healthy, and satisfying soup. It’s great on its own, but is even better topped with fresh sourdough croutons and a little Parmesan cheese. For a meatier version, crumble cooked bacon or sausage into the soup. Preheat the oven to 450 degrees. In a large stockpot, heat 2 Tbsp. oil over medium-high heat. Add the onions and garlic and cook, stirring occasionally, until the onions are tender, about 5 minutes (if you are using dried basil rather than fresh, add it now, too). Add the beans and broth. Bring the soup to a boil, reduce the heat and simmer it for 3 – 5 minutes until you are ready to puree it. Meanwhile, make the croutons. 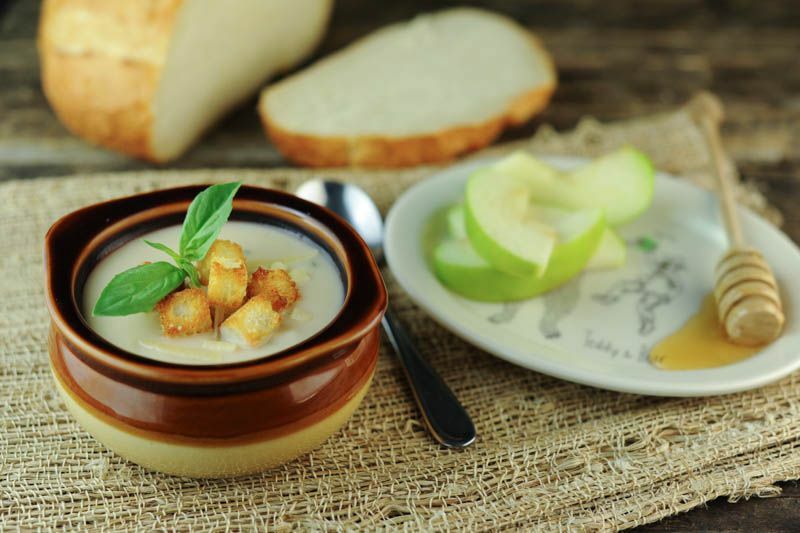 In a medium bowl, toss the bread cubes with 1 – 2 Tbsp. oil and the salt. Place the cubes on a baking sheet in a single layer, and bake them for 3 – 5 minutes, until they are lightly browned and slightly crisp. Watch them carefully so they don’t burn. While the soup is simmering, puree it with a hand (immersion) blender, if you have one. If not, remove it in batches and puree it in a standing blender, and return it to the pot. Simmer the soup for about 5 more minutes. Stir in the sherry or vinegar and ladle the soup into bowls and top it with the basil, croutons, and Parmesan cheese (optional). Alternatively, refrigerate the soup and store the croutons in a sealed bag for up to 2 days. Place the onions and garlic in the slow cooker (if you are using dried basil rather than fresh, add it now, too). Add the beans (use 2/3 lb. of dried beans instead of canned if you prefer) and enough broth to cover the beans. Do Ahead or Delegate: Chop the onion, peel the garlic, cut 2 slices of the bread into cubes, make the croutons, grate the cheese if necessary and refrigerate, or fully prepare and refrigerate the soup. Scramble Flavor Booster: Season the soup at the table with hot pepper sauce, such as Tabasco. Tip: Select the proper knife for the job: A Chef’s knife with a big, wide blade is good for most chopping, mincing, slicing, and dicing jobs. Use a small paring knife when peeling fruits and vegetables and removing seeds or pits from fruit. A serrated knife is best for slicing bread and smooth skinned fruits and vegetables like peppers, eggplant, and tomatoes. Make sure and sharpen your knives every few weeks for safer and easier slicing and dicing.